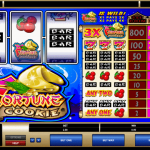 Fortune Cookie is a nice Asian themed video slot game from Microgaming. You have probably had a chance to crack a fortune cookie at least once in your life time and have seen that the notes are sometimes right and sometimes wrong, depending on what is going on in your life. But, this fortune cookie can bring real fortunes to your balance, you just have to hope that luck is on your side when you play the game. The best way to find out what the future holds for you is to spin the reels and see it for yourself. 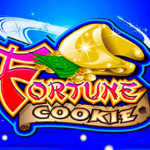 Fortune Cookie is a classic slot so we know what that means. There is no abundance of special symbols and special features here in this game. The only special symbol that we are looking forward in this slot is the wild symbol. Its only function is to substitute for every other symbol and to complete a winning combination. Every time a wild is a part of a winning combination your win will be a subject of a x 2 multiplier, and if you manage to land 2 wilds your win will be a subject of a x 4 multiplier. What is more, you do not need to open a fortune cookie to see what your chances of winning are. The pay table is right in front of you to the right of the reels. 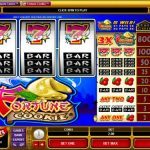 Microgaming`s classics are unique and time cannot beat them, and Fortune Cookie is another proof to that statement. This is a simple slot with a conventional game play. If you are a fan of retro games or Asian themed slots then this is the perfect one for you. SOmetimes all you want is a good old classic slot game. Fantastic 7s a 3 reel slot by MicroGaming is exactly that!